FOOD SAFETY: ENFORCEMENT BEGINS LATERALLY. FOOD SAFETY OFFICERS AT THE STAGE. The much awaited Food Safety and Standards Act,2006 has come into force on and from 05.08.2011 and it extends to the whole of India. This is an Act to ensure safe,hygenic,wholesome food to all. The part time Food Inspectors who were working in the Local bodies and in Primary Health Centres have been re-designated as full time Food Safety Officers and have been posted under the Food Safety and Standards Department of the States. There was havoc among the traders about the new Act. They are unaware that this Act is a comprehensive one with graded penalties and it provides safeguards for consumers with a provision for food recall procedures. The Government and the Food Safety and Standards Authority of India were also keen on enlightening the Food Business Operators and the public about the comprehensiveness of the law, so that the enforcement could be a lateral one rather than a vertical one. With a view to fulfill the expectations of the Government and FSSAI, an awareness program was conducted to the Food Business Operators of Tirunelveli city on 18.11.2011.Representatives from various service organisations of the Food Business Operators participated in the campaign. It was equally punishable with six months imprisonment and with a fine of Rs.1000/- both for adulterating a food and also for misbranding it, as per the repealed Act. Misbranding, among other things,means non declaration of mandatory label declarations on the label by the manufacturers. But the new Act provides for graded punishment based on the gravity of offence. 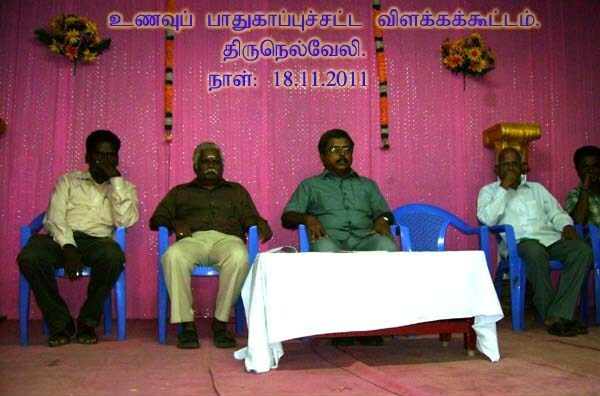 The Food Safety Officers of the Tirunelveli District explained the new Act and its provisions. There was an interogation at the end of the session to make it a two way communication. Mr.A.R.Sankaralingam, Food Safety Officer answered the queries raised by the Food Business Operators. PRESS NEWS IN LOCAL DAILY. The Food Business Operators went back with a clear knowledge about the new Act, which provides severe punishment only for voluntary adulteration.